Burbank, CA – The city of Burbank prepares to host the largest martial arts convention on the Western coastline. Referred to at the Dragonfest Convention and hosted by the Martial Arts History Museum, is set to draw in thousands of martial arts enthusiasts, fans and lovers of the kung fu theater genre. Dragonfest will be held in the grand ballroom at the Holiday Inn Media Center this Sunday, May 18, 2014. A few of the more notable guests who will be on hand for fans include veteran actor James Hong, film great John Saxon, film star Cynthia Rothrock, director Art Camacho, Tak Kubota, Benny Urquidez, Carrie Ogawa-Wong, Peter Kwong, Bill Ryusaki, Eric Lee, Gerald Okamura, Cheryl Wheeler, TJ Storm and more. Dragonfest is divided into a variety of sections and will be featuring celebrities, authors, new films, vendors and special effect artists. Authors coming to the event include Doug Wong, Allen Woodman, Peter Cunningham, Nancy DeLong, Steve Sexton, Lambert Cheung, Sol Kaihewalu, Don Baird, Leo Fong and Carl Totton. New films will also make their debut including the CNC Movie Factory, ShowVIS, The Gathering, The Stunt People and Traditionz’s Martial Arts Kid. In fact, a scene from The Martial Arts Kid will actually take place at Dragonfest. Some of the greatest effects artists and sculptors having a booth include Neil Winn, Erick De La Vega, Norman Meyers, Calvin Lo, Rick Zar, Alfred Paredes, Koji Ohmura, Jason Crager, Scotty Fields and Hiroshi Kategiri. The artistry of the arts will include such notables as Emmy-Award winner for The Simpsons Paul Wee, Mel’s Props, Ed Parker Jr., Jerome Lu, Justin Waggle, 2K Kustoms and Traditionz t-shirts. Topping off the list of vendors includes Sidekick Publications, Dynamic Dojo Talkradio, Valley Martial Arts Supply, Kil Kombat Instruments, Pacific Assn. of Women in the Martial Arts, United Martial Arts for Christ, Filipino Arts with Felix Roiles, World Wide Martial Arts Council, Cane Masters, Masters Hall of Fame, Joy of Kung Fu, Halas Jewelry, Samurai Sports and The Whipping Willow Association. “As an added bonus, we are proud to feature Master Ken, a martial arts comedian and an internet sensation and Nick Palma, one of the original Ninja Turtles who will be walking around greeting guests,” adds Matsuda. 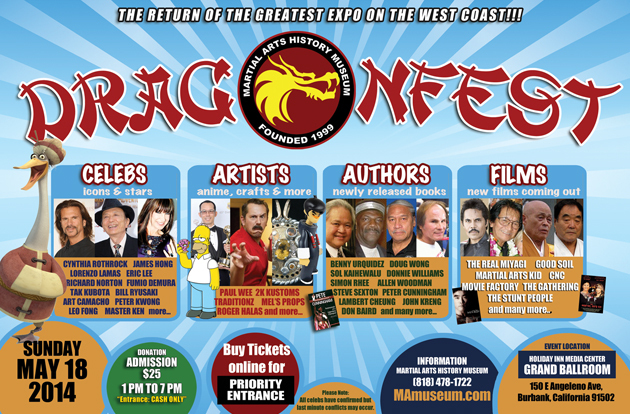 The Dragonfest Convention will take place at 150 E. Angeleno St., Burbank, CA at the Holiday Inn Media Center. Entrance is cash only. The event begins at 1 pm and ends at 7 pm. The Martial Arts History Museum is a non-profit 501c3 organization and this event is a fundraiser for the Museum. For information on Dragonfest, please visit their website at www.MuseumDragonfest.com. For information on The Martial Arts Kid movie visit their kickstarter page at https://www.kickstarter.com/projects/1088382504/the-martial-arts-kid.